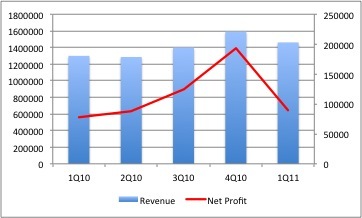 Tradewinds Malaysia 1Q2011 performance was poorer as compared to the previous quarter. Revenue and earnings dropped by 8.2% q-o-q and 53.5% q-o-q respectively to RM1.46 bil and RM89.9 million respectively. The drop in earnings was mainly attributed to lower production from plantation division (Seasonal factors) and lower earnings from sugar refining division. 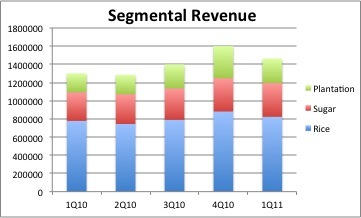 Nonetheless, as compared to 1Q2010, revenue and net profit actually rose by 12.4% y-o-y and 16.4% y-o-y respectively. 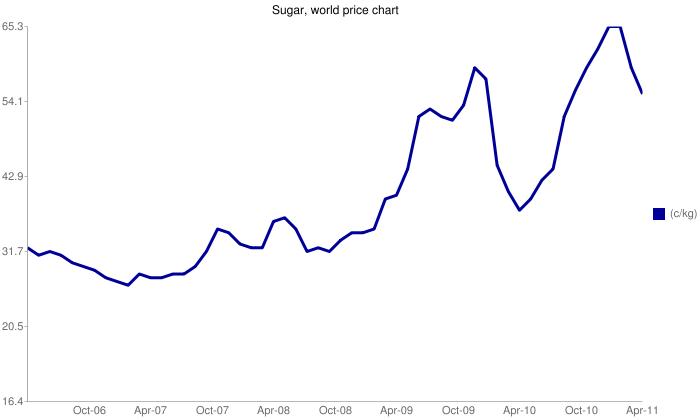 Despite the higher revenue from sugar division, its operating profit was down. 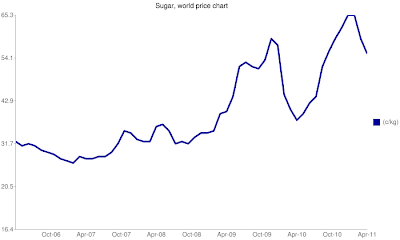 This could be due to the international sugar price which rose to the highest at 65.3 cents/kg in Jan 2011 before dropping to 53.7 cents/kg in April 2011. The following quarter could be better as Malaysian sugar price was hiked recently while at the same time international sugar prices continue to drop. 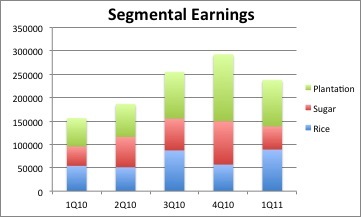 EPS for this quarter was at 31 sen while trailing 12-Month EPS was at RM1.67, thus PER remains low at only 5.6x. Net gearing continued to drop from 1.07x in 1Q10 to 0.8x in 1Q11. Owing to the favorable prospects arising from hike in Malaysian sugar prices and declining international sugar prices coupled with CPO prices which remain firm, Tradewinds remains attractive and profits should exceed RM400 mil this year. Plantation division's performance in the following quarters of this year is expected to improve over the current quarter's while its rice division is expected to maintain its performance. Just read an article from TheEdge Weekly which mentioned a target price of RM15 for Tradewinds, in line with what I have in mind as well. Nonetheless, due to the current blip in 1Q11 results and the strong run-up in its stock price, we might see some profit taking at this moment. For longer term investors, do take advantage of the current price weakness as this stock remains very undervalued.